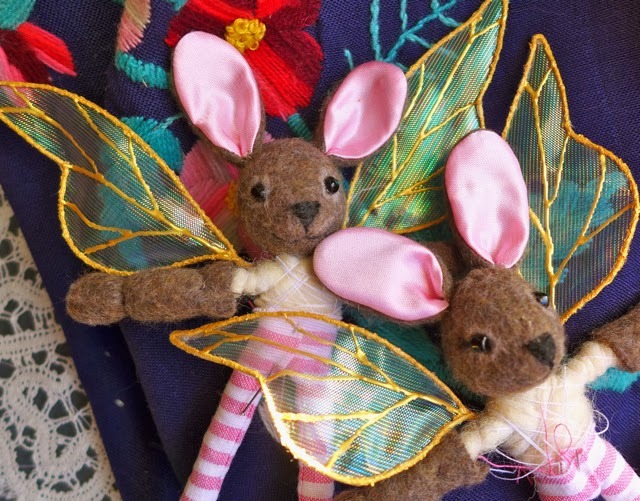 Something special for the end of the year, Fairy Bunnies! These 2 will be the last dolls added to the shop in 2013 & I have to thank Rhissanna for the idea (Thank you!!)... BTW you should go see her wonderful Alice on Etsy...so cool! They should be finished today and I'll post a listing time on Facebook when I know what that will be. Also I'll be closing the shop for the holidays on December 21st, so if there's something you want to order please act quickly. And a big thank you for all your wonderful comments... and of course sales :) They make my days so much nicer! Oh my! I missed this post! You're very welcome, Cynthia. I think your Fairy Bunnies were extraordinarily sweet. I love your bunny dolls and your wings are so delicate, I really wanted to see the two elements together.Look at how happy they are! Thank you for mentioning my Alice doll and putting up a link. Hugs and Happy New Year!